No gimmicks here, just an honest to goodness haircut or chemical service served to you with a smile. 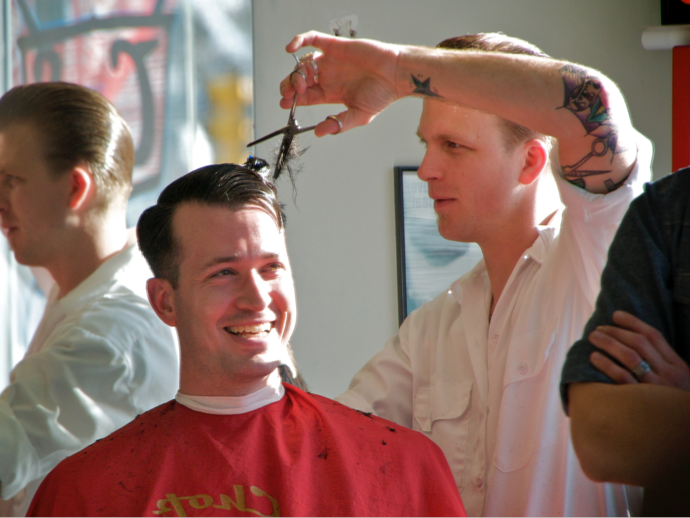 The Berkley Chop Shop specializes in period correct hair cuts to the latest modern fashions. Custom cuts that not only fit your personality but compliment your look. At the Chop Shop, we’re not happy unless you are happy and most of all, if you don't look good, we don't look good. In order to serve you better we accept appointments by phone and online. Please call ahead or use our online service make arrangements with your favorite Chop Shop barber in advance. The Chop Shop appreciates all of their customers and your feedback is important to us. Please email concerns and suggestions to berkleychopshop@gmail.com. Thanks for everything, and remember... We don't look good if you don't look good. Call ahead for an appointment or book online. Appointments also available before & after normal hours. We are looking for individuals with experience, an eye for detail, and a committment to quality service. Use this link to apply online.